The Waterman Patrician is among the most coveted fountain pens still available to collect. Ebay lists Patricians ranging from a few hundred dollars up to $5000. I am fortunate to own two Patricians: an emerald green one pictured above and a moss-agate. Waterman introduced the Patrician in 1929 just at the start of the Great Depression. The timing couldn’t have been worse since the pen sold for the astronomical price of $10. 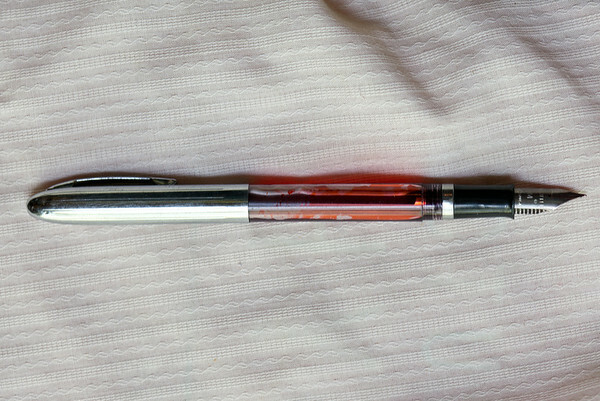 The pen contained many hand-made parts that raised the manufacturing cost. Patricians were not actively manufactured after 1936. Patricians were expensive to make because they contained many hand-made parts. 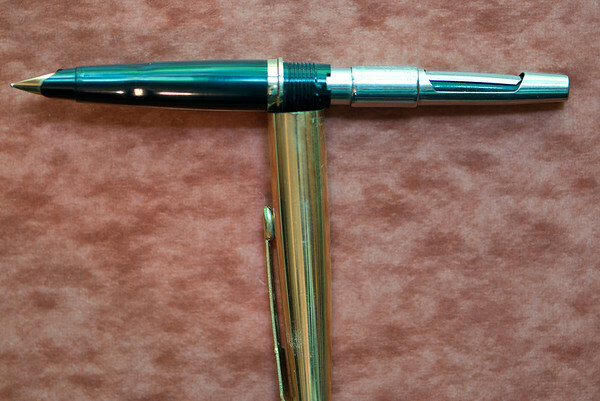 The pen’s design looked back to the opulent pre-Depression era. 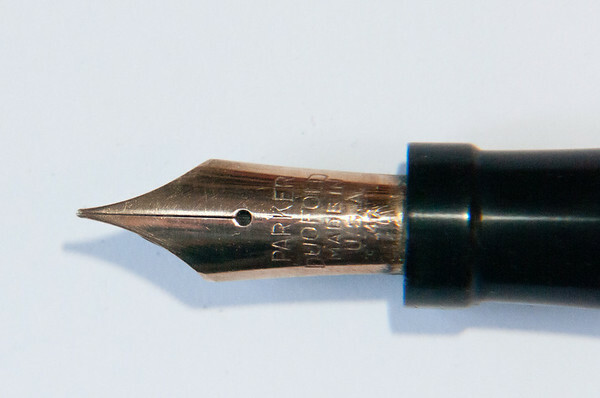 Competitors produced modern designs, like the Parker Vacumatic, that were both cheaper and more innovative than the Patrician. Relatively few Patricians were made, given the high manufacturing cost and the low demand during the Depression. This explains why it cost so much to buy a Patrician today. Founded in 1884, L. E. Waterman is the oldest fountain pen manufacturer among the Big Four. Several companies began making fountain pens around this time, but Waterman’s design proved to be the most reliable. L. E. Waterman’s first pens were eye-dropper fillers made of hard rubber. These pens let ink flow out of the reservoir without blobbing. In 1915 Waterman introduced a level filling mechanism that became their primary filler until the 1955. In the years preceding the Patrician, Waterman made many innovative and interesting pen models. Most were designated by a number system that reflected, among other things, the size of the pen. These pens were made of black hard rubber, often chased, sterling silver, 14k gold, and gold filled metal. 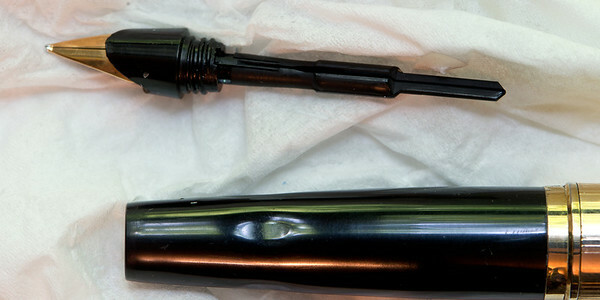 The Patrician was the first plastic pen Waterman made. Most models that came after the Patrician were made of plastic, although they continued to make silver and gold pens that sold at high prices. Although it is debatable, I think the Patrician was the last great pen that Waterman made. Some people like the Hundred Year pen, which was made from 1939 to c.1949. However, most examples I’ve seen have severe deterioration at the end of the barrel where a bright colored end was attached. 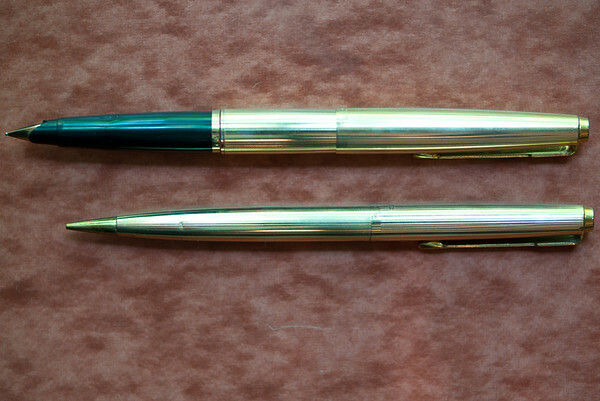 By the 1950s, Waterman was reduced to copying other manufactures—and doing a poor job at that—as witnessed by the Taperite, a Parker 51 knockoff. 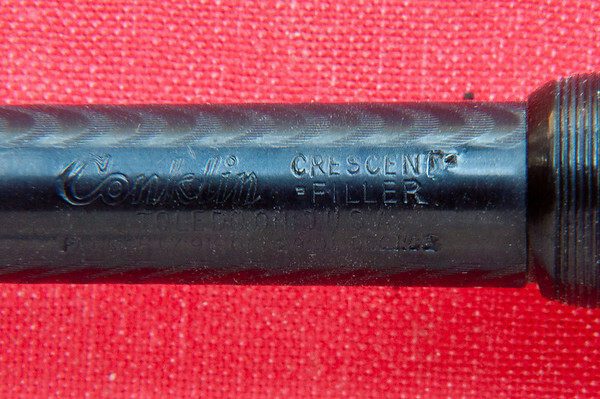 In desperation, Waterman made a cartridge pen, the C/F, before ceasing operations in 1956. Waterman had a French subsidiary called Waterman JIF. With the demise of the American parent, Waterman JIF struck out on its own. They were successful and eventually bought out their former parent’s assets. The Waterman pens made today are from the Waterman JIF branch of the company, although the path to the present company is convoluted. The Patrician is slightly smaller than the Duofold Centennial when both are posted, although their lengths are just about identical when capped. Both of these pens are oversized compared to the average pen. 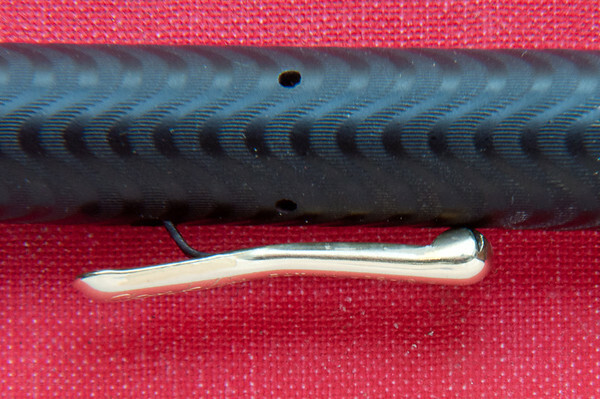 Waterman used their standard lever filler in the Patrician. This is the same mechanism that was used, with minor cosmetic changes, from 1915 until the 1950s. 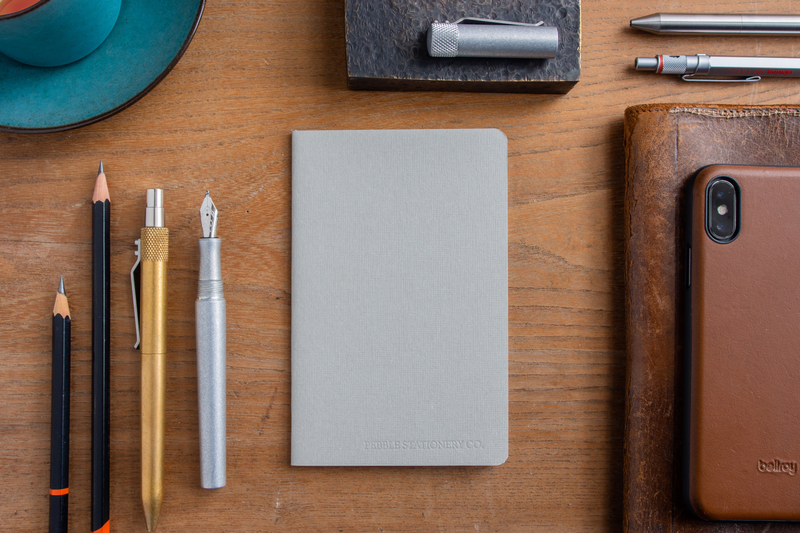 The clip and band were specially designed for the Patrician and were meant to give a feeling of opulence to the pen. These accouterments have the feel of Greek columns. The bottom of the barrel should also have a gold filled disk glued in place. Unfortunately it is missing from my pen. The imprint on this Patrician shows few signs of wear and is sharp and clear. 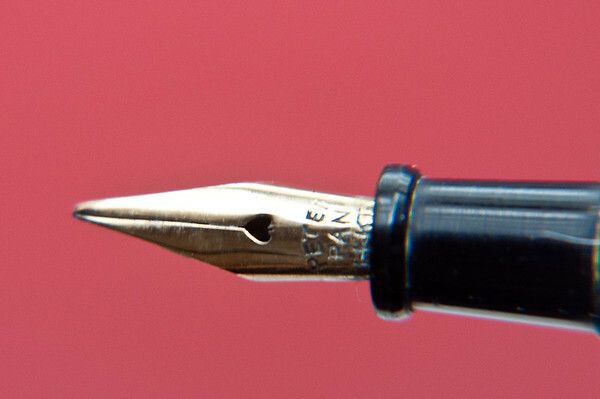 The Patrician nib was meant to compliment the luxury feel of the pen. By modern standards it appears too broad and stubby for its height. It is as if Waterman was showing off how much gold they could stuff into the nib since, for a fancy pen like this, money is no object. The engraving on the nib is sharp and clear. Richard Binder is an excellent online reference on the history of the Patrician. The Fountain Pen Board displays a photo of all the different Patrician colors. 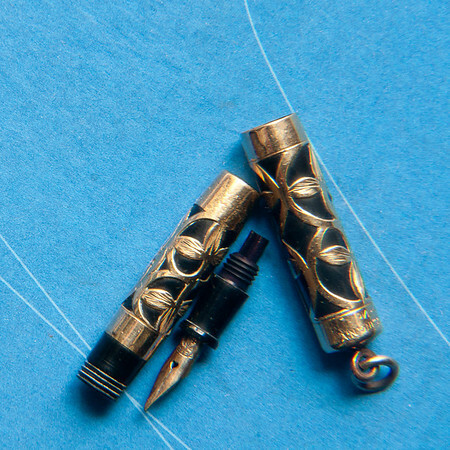 The Patrician was the high point of art deco opulence for Waterman pens. Unfortunately their timing was off on two counts. First the pen looked backwards to the 1920s when the other big pen manufacturers were streamlining their pens in the modern style that was in demand. Second the pen was expensive to make since it contained a lot of custom, hand-made parts that added significant costs. The pen was introduced on the eve of the Depression. This doomed the pen to failure because the price was out of reach for most people. As you can see from the picture above, I’m a big fan of Esterbrook pens. That wasn’t always the case. Like most fountain pen collectors in the 1980s and 1990s, I considered Esterbrook pens to be one step above junk. Sure they were well-made, functional and versatile, tough and durable. But they had steel nibs during a time when only pens with 14K nibs were considered collectable. My previous post was about the Parker 45 Signet. In that post I discussed the screw-in nibs used in the Parker 45’s. Twenty-five years before the debut of the Parker 45, Esterbrook introduced the screw-in nib for their fountain pens. 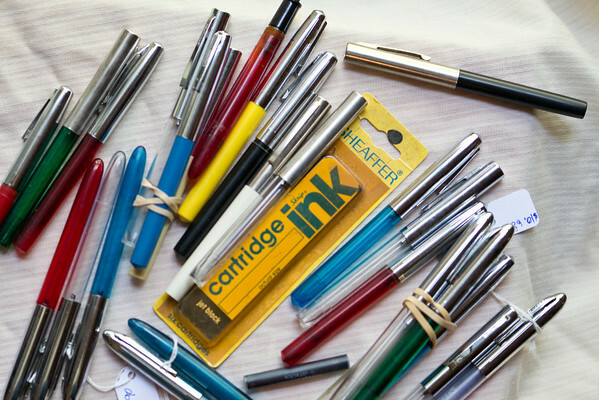 What makes Esterbrook pens unique among those pens featuring easily interchangeable nibs, is the vast variety of nib choices available. You could choose from more than 30 different nib styles for any Esterbrook model. I’ll focus on the Esterbrook Dollar pen above. I’ve carried this pen with me continuously for the past five years. For the past year I’ve filled it with Noodler’s Heart of Darkness ink. This ink is not only quite dark, but is waterproof, which makes it perfect for signing checks and addressing envelopes. 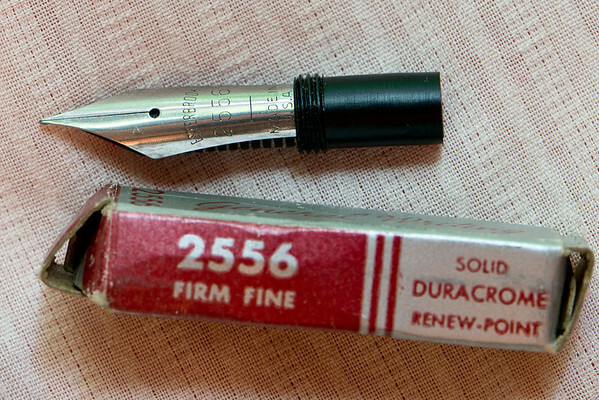 The nib currently in use is the 2556. An unused sample is shown below. Richard Esterbrook founded Esterbrook Pens in 1860, which made the company much older than Waterman, Parker, Sheaffer, or any other well-know fountain pen manufacturer. Esterbrook manufactured nibs for dip pens from its inception. During the Golden Age of Fountain pens, perhaps from 1900 - 1935, Esterbrook continued to make only nibs for dip pens. It wasn’t until the mid 1930s that Esterbrook decided to make fountain pens that could take advantage of the 30 or so nib models that were used on dip pens. 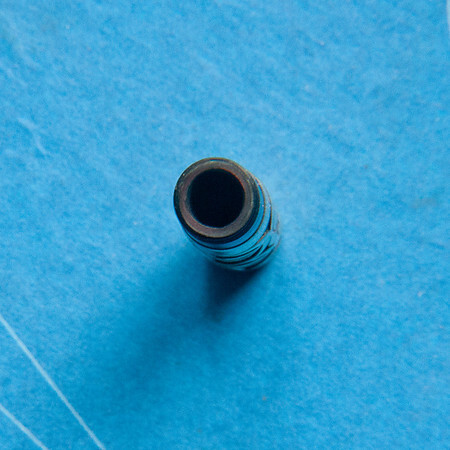 By making an integrated nib and feed unit that screwed into the section of their fountain pens, they were able to offer all the steel nibs to fountain pen users that were available for dip pens. Esterbrook made some beautiful pens in marbled plastic into the early 1960s as can be seen in the picture at the top of this post. 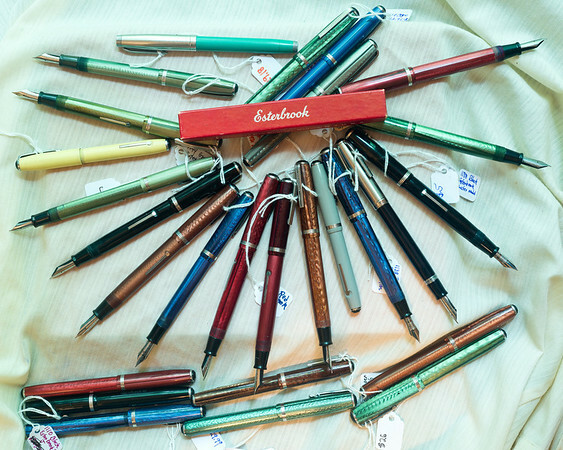 When cheap and convenient ballpoint pens overran the market during the 1950s and into the 1960s, Esterbrook tried desperately to stay competitive by introducing not only ballpoints of their own, but also cartridge pens for those people who still wanted to use fountain pens but didn’t want the “mess” of filling their pens from a bottle. Nothing worked. According to David Nishimura, the company merged with Venus in 1967 and went out of business in 1971. As you can see, the Dollar Pen is noticeably smaller than a modern Duofold Centennial, which I’ve generally used for size comparison. To some, the Dollar Pen might be a bit short to use unposted. It is quite comfortable to use posted. The Dollar Pen weighs about half of what the modern Centennial weighs. But the Centennial has a brass core and feels quite heavy. The Dollar Pen feels right. My Dollar Pen is from 1938 - 1940. 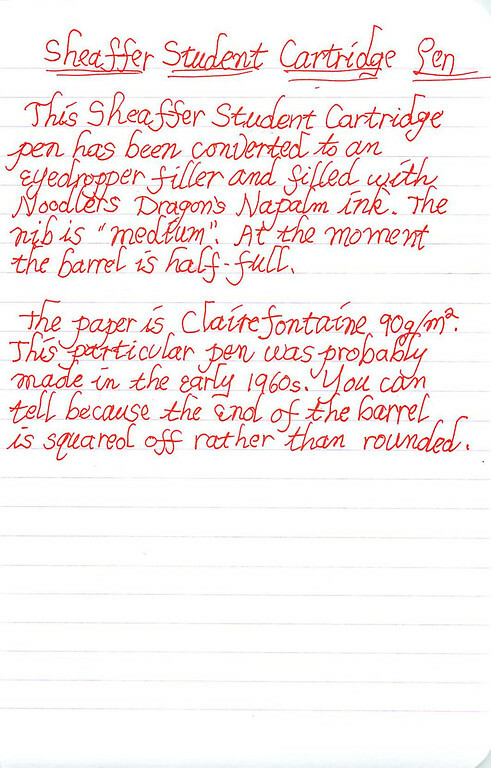 Identification is based on Paul Hoban’s excellent book, The Fountain Pens of Esterbrook. The Dollar pen is smaller than the more popular “J” pens and their variants (SJ and LJ). Dollar Pens have distinctive cut outs in the clip. 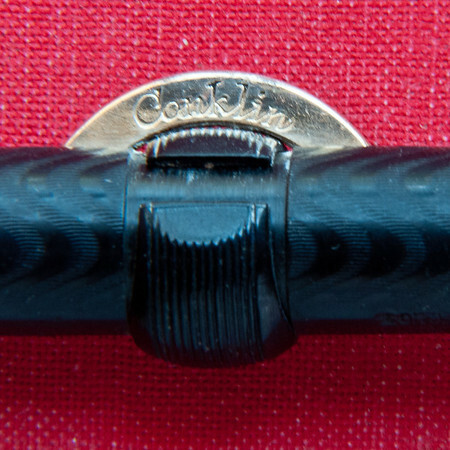 The cut outs were more rounded in the earliest versions of the Dollar Pen, c.1936. Even though the pens was made in the 1930s, the style is closer to the classic 1920s flat-top designs of the big four pen makers. 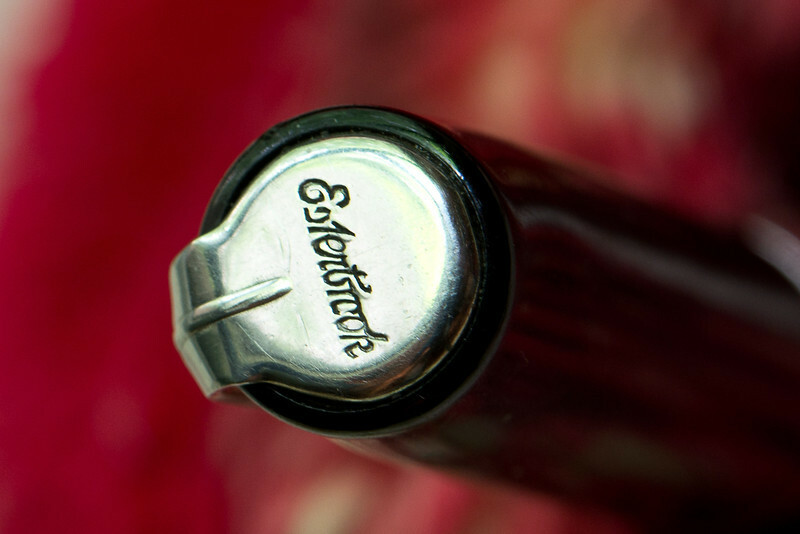 The top of the cap of the Esterbrook Dollar Pen was chrome and contained the word Esterbrook written in cursive script. 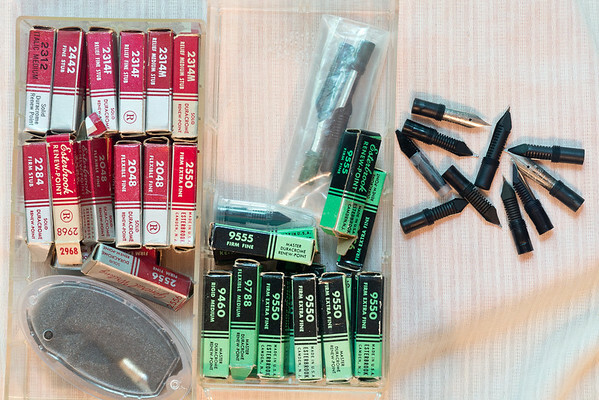 This picture shows the variety of screw-in nibs still available for Esterbrook pens. With rare exception, these nibs will fit in any Esterbrook fountain pen. I have bought a few Esterbrook desk pens on eBay, when the price was right, just to acquire the nib for use in an Esterbrook pocket fountain pen. The easily interchangeable screw-in nibs are what make Esterbrook Pens so popular today, even among collectors who are mostly interested in new pens. The ability to transform your Esterbrook pen, in 10 seconds, from a firm medium nib to an ultra flexible “Spencerian” broad nib makes these pens extremely attractive. Anderson Pens is a great source of Esterbrook nibs at fair prices. 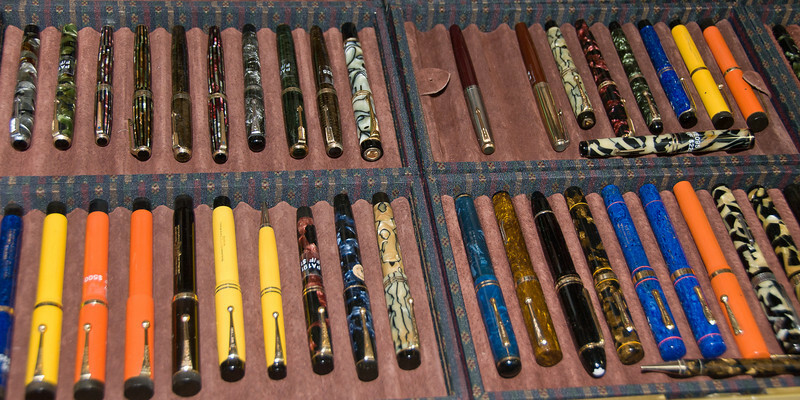 Richard Binder, a well-known nibmeister, has a well-researched table of all the Esterbrook nib models manufactured. Several well-known bloggers, who primarily write about contemporary rather than vintage pens, are also interested in Esterbrook pens. Ray at Fountain Pen Quest has written many posts that discuss different Esterbrook nibs. 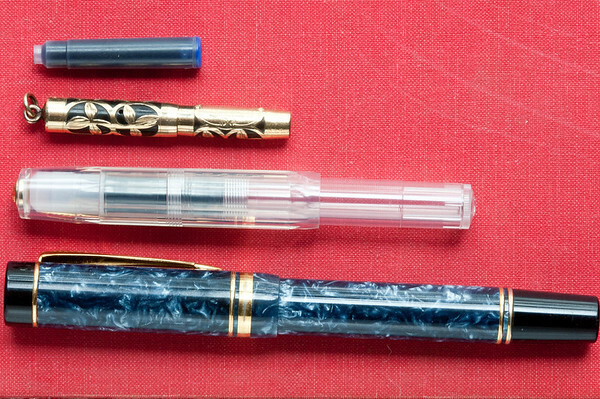 His most recent blog post on an Esterbrook nib is here. Ana at The Well-Appointed Desk has also written a half-dozen or more posts about Esterbrook pens and specific nibs. Her most recent Esterbrook post can me found here. Both Brad and Jeff have each written about Esterbrook pens at The Pen Addict. Their most recent post was also about the Esterbrook Dollar Pen. The Esterbrook Dollar Pen was a tough, durable, and versatile pen, just like the models that followed it (“J”, “LJ”, and “SJ”). Not only is it well worth having an Esterbrook pen in your collection, but it is a good idea to acquire several Esterbrook screw-in nibs. The ability to change from a normal everyday nib to a broad stub signature nib and then back to the original nib all in a few seconds and with minimal fuss make Esterbrook pens a great addition to any pen collection. 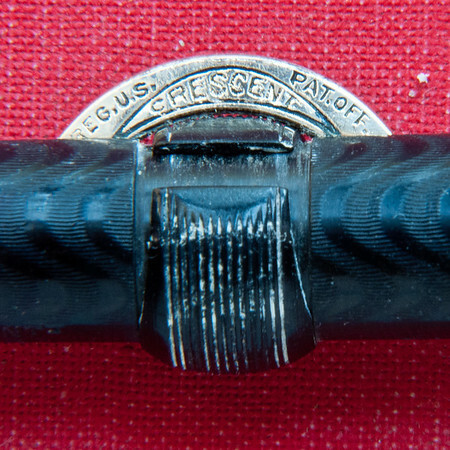 Although this Dollar Pen is a rather plain black, many of the Esterbrook pen models come in beautiful marble patterns as illustrated at the top of this post. Today’s post features what is probably the smallest pen ever made: the Peter Pan pen from the Salz Brothers Pen Company. Pens we think of today as small, like the Kaweco Sport, look like giants when seen next to the Peter Pan pen. The Salz Brothers Pen Company was founded around 1920 in New York City by Ignatz, James, and Jacob Salz. Salz initially produced high quality pens, but over time the quality deteriorated. The company went out of business around 1950. Some nice examples of early Salz pens can be found at PENS PAPER INKS…WHATEVER!, including this 1920s pen and pencil set. The website also gives a brief history of the Salz Brothers Pen Company. Salz pen and pencil set from the 1920s. Image from PENS PAPER INKS…WHATEVER! There is limited information available about the Salz Brothers Pen Company. Richard Binder, an extremely knowledgeable pen collector and highly respected nibmeister, has some useful information. Worthpoint has some details on the later years of the Salz Brothers Pen Company including the name change to Stratford Pen Company. My Peter Pan pen is an early model, probably from the early 1920s, and is typical of the style popular in the early twentieth century. The barrel was made of black hard rubber and overlaid with a gold filigree pattern. There is a solid area where a name could be engraved. The gold overlay on the Peter Pan was, in fact, actually gold filled, which meant that 10% of the material used for the overlay was made from 18K gold. 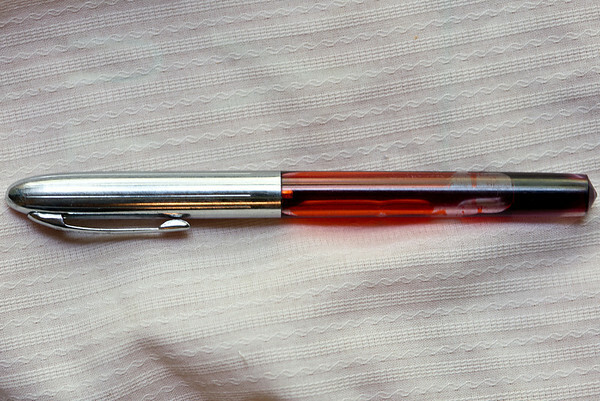 The pen was too small to hold a lever or button filler that was typically used when this pen was made. You can see from the picture above that even a short international cartridge would have too big a diameter to fit inside the barrel, in addition to being too long. The pen has a small ring at the top of the cap. A ribbon or chain was passed through the ring so that the pen could be worn by a woman around her neck. The pen then served a dual purpose: a writing instrument and a piece of jewelry. The weight and size of the pen are given in the table below. The Peter Pan weighs in at ridiculously light 4 grams, or only 14% of a modern Duofold Centennial. It is interesting to see that the Kaweco Sport, which is considered a small pen today, is just about twice as long as the Peter Pan pen. 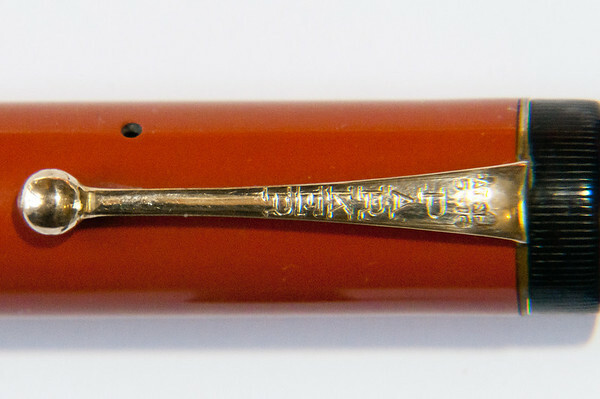 The nib of the Peter Pan pen is usually described as a No. 1 0, that is, the smallest nib size in use. 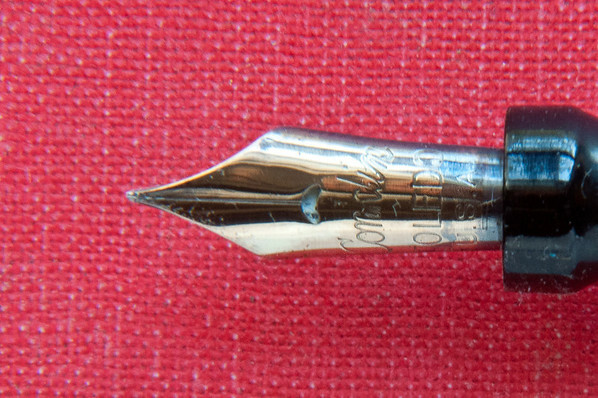 The nib is inscribed “Peter Pan 14 KT”. As mentioned earlier, the pen is an eyedropper filler, that is, the ink is squirted into the barrel and the nib/section is screwed back into place. I was curious about the ink capacity of the barrel, so I measured it. 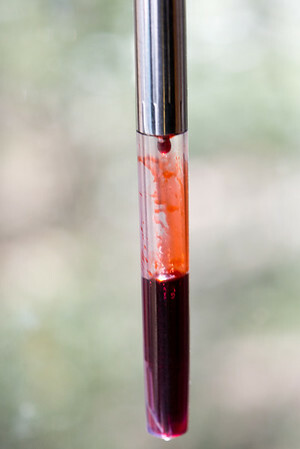 The Peter Pan pen can hold 0.4 mL of ink. This volume is about 1/100 of an ounce. According to Wolfram Alpha, this is the equivalent of 2/3 of a plain M&M, although I imagine it’s not as tasty. The engraving on the cap says Salz Brothers and 18 K - 1/10, which indicates that the hard rubber body is covered with a gold filled alloy. 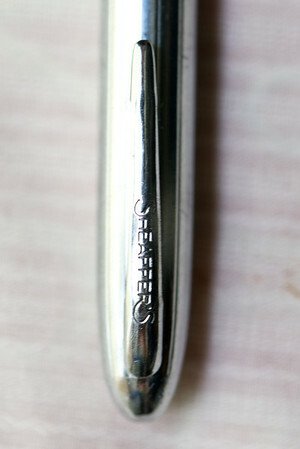 The Salz Brothers Peter Pan pen is an example of the pens produced during the early years of the company (1920s). The materials and workmanship were of high quality, unlike the pens made during their later years. I am fortunate to have another Peter Pan pen in my collection. It differs from the one shown here only in that the gold filled exterior is solid (not a filigree pattern) so the hard rubber doesn’t show through. It’s too bad more isn’t known about the Salz Pen Company, but I suppose that is because they only made quality pens during the first part of their existence. There would be little interest in the low quality pens made during the later years. The Parker Pen Company was founded in 1888 by George S. Parker. Parker has made pens continuously since then and is still in business today. Parker was one of the Big Four pen companies that dominated the fountain pen industry during its Golden Age. For more information, see the companion article Parker Models found at the tab above. This picture, like all the illustrations in this post, shows my 1928–9 Big Red Duofold Senior. The Duofold was launched in 1921 with the Big Red model, which has since become the most recognizable Duofold color. Originally the pen was made from hard rubber, but in 1926 Parker plastic models. Plastic pens quickly dominated the market and were the mainstay of pen manufacturers ever since. Duofolds sold for $7, which was considered outrageously expensive at the time. Nevertheless the public fell in love with the pen and were willing to pay this extravagant sum to own one. I own several Big Red Duofold Seniors. The specific one shown in this post was made in 1928 or 1929. It has two thin gold bands on the cap, that distinguish it from earlier models that had either no band, or a single large band. Later models, know as Slimline, although also having two thin bands, had caps that tapered somewhat so that the top of the cap had a smaller diameter than the bottom where the threads were located. The weight and size of the pen are given in the table below. The Duofold Senior weighs in at surprisingly light 21g compare to a modern Duofold Centennial that weighs 29g. The extra weight of the Centennial is due to the brass casing for the filling mechanism. 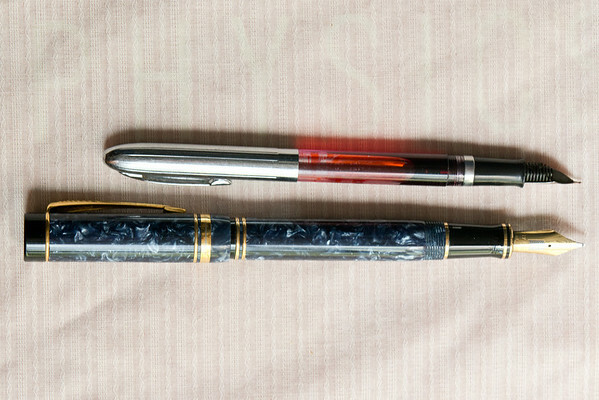 The size of the Senior and Centennial are virtually identical, which shows how carefully the designers of the modern pen were to be faithful to the 1920s design. The nib of the 1928–9 Duofold Senior is appropriately sized for a pen of these dimensions, that is, it’s quite big. It is, of course, made from 14K gold, which was the standard for that day. 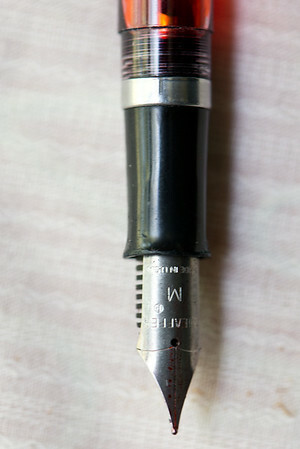 The nib is inscribed “Parker Duofold Made in USA” . 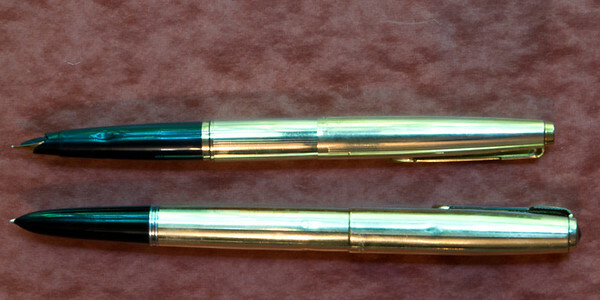 The 1920s Duofold pens carried over the button filler mechanism that was used in the Jackknife Safety pen and other predecessors of the Duofold. Pushing in the button would cause a thin metal strip to bow towards the center of the barrel causing the ink sac to compress. 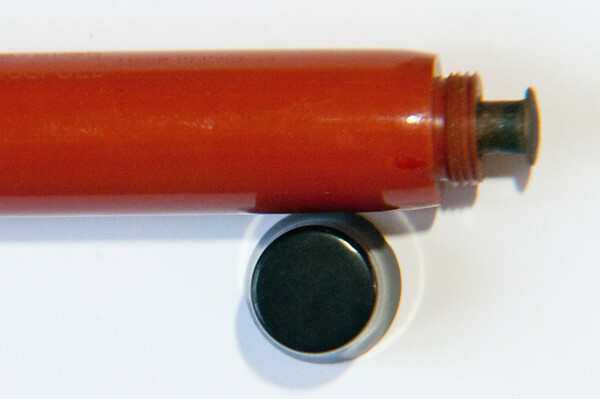 Releasing the button while the nib was immersed in ink caused the ink sac to fill. The imprint on the barrel is somewhat worn, but it is clearly legible. 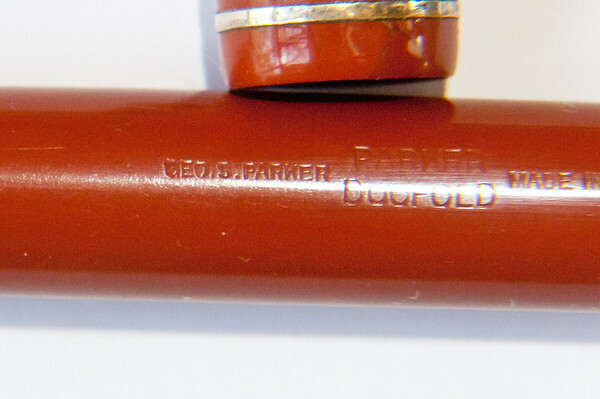 The imprint reads George S. Parker—Parker Duofold—Made in USA. The clip was large and gold-filled. 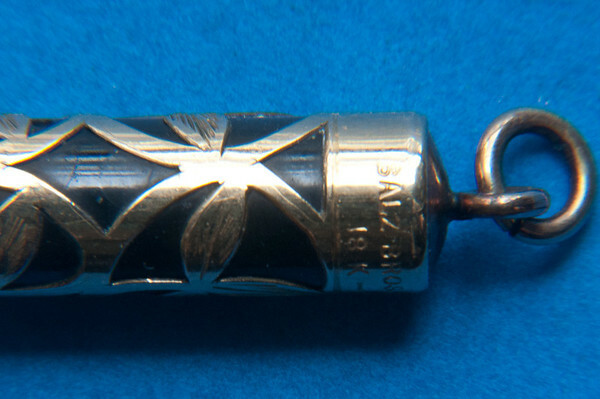 The engraving on the clip reads “Pat. SE 5–16” at the top and “Parker ” written vertically. 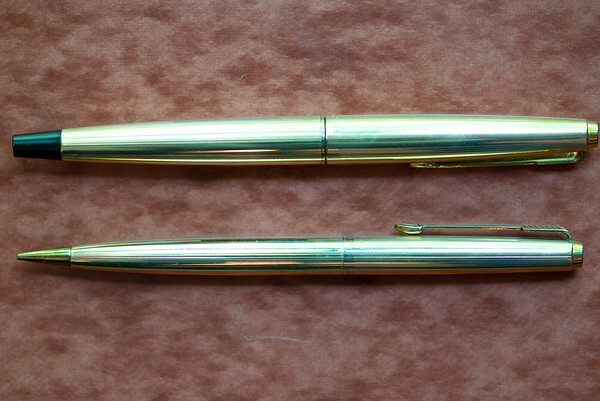 The 1928–29 Parker Duofold Senior was one of the most prestigious and expensive pens of its time. It was meant to reflect the importance of the user and to make a statement. The large size and the amount of gold in the nib was meant to impress people. This was the kind of pen that was used to sign a bill into law, or, for lesser mortals, sign a mortgage contract. This particular unit has some flaws. There is a series of gauges in the barrel where a tool of some sort seems to have slipped. The imprint is worn, but easily readable. Also, it looks like the lip of the cap had a chip knocked out and later glued into place. These noticeable flaws made the pen less valuable and I purchased it for somewhat less money than a pristine unit. Perhaps some day, if the mood strikes me, I might fill this pen with ink and write with it. A little extra wear probably won’t hurt the value of this pen as it would one in better condition.